Solid State Molecular Sensor (SSMS): a nonlinear, birefringent, chalcopyrite wave-guided technology. It detects, discriminates, and measures concentrations of target molecules in an ambient background in real time. It does so by employing resonant phase- and/or amplitude sensitive detection over a large, tunable spectral range. The SSMS can be made to be sensitive to one specific group of molecules by setting up appropriated phase matching conditions. The SSMS response is unlike that of a linear wave-guided sensor in two primary areas: change of frequency output, and intensity of the output light generated. Both signals are generated in a nonlinear second harmonic generation (SHG) process. This process is very sensitive to small changes in the phase matching conditions. The SSMS is a miniaturized technology. Directed beam of atomic particles, atoms, molecules, or ions emitted from a nano-size jet nozzle and governed by the laws of quantum theory, but which may also operate in the classical regime governed by the equations of classical fluid dynamics. Nanojets have a myriad of important, modern day applications for which our model can be used: nano-circuitry and electronics; nano-propulsion / thruster systems; fuel injectors for microscopic engines; atomic optics and interferometry; etching and lithography; drug delivery systems; injecting genes into cells; mass spectrometer; and quantum sensors. Partners: Dr. Frank Madarasz and Georgia State University. 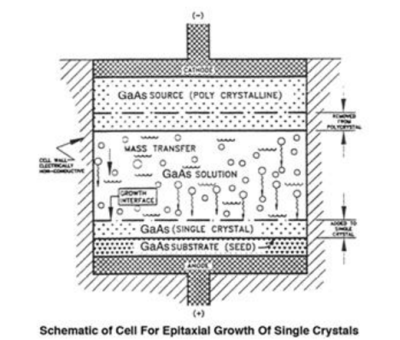 LPEE is a unique and revolutionary bulk-growth technology that produces single crystals. It is an isothermal solution technique, which is initiated and sustained by passage of an electrical current through the solution=0substrate interface. The process offers fundamental advantages in that it operates at temperatures and pressures significantly below that necessary for other bulk growth rate. Crystals produced by LPE are fare superior in terms of purity, structural perfection, surface morphology, and homogeneity. The process has been shown effective over a broad span of III-V crystalline materials including their binary, ternary and quaternary compositions. It is easily interfaced with existing Si and III-V compound electronic components. Applications include: quick and remote screening of air pollutants; recognition of chemical and biological hazards in the environment, monitoring of surface corrosion/etching processes; as well as bio-medical testing. The SSMS has two patents with one additional patent pending, which is a “spintronics” variation of the concept. ​Partners: Dr. Frank Madarasz and Georgia State University. The present material of interest is gallium nitride and related alloys, which have use in numerous defense and commercial applications; for example: communication and intelligence gathering satellites, undersea devices, smart weapons, sensor and detection systems, light imaging devices, CCDs, wireless and fiber optic communications, high-speed signal and data processing, phased array and staring radar.